Your nut-free baklawa recipe is here! 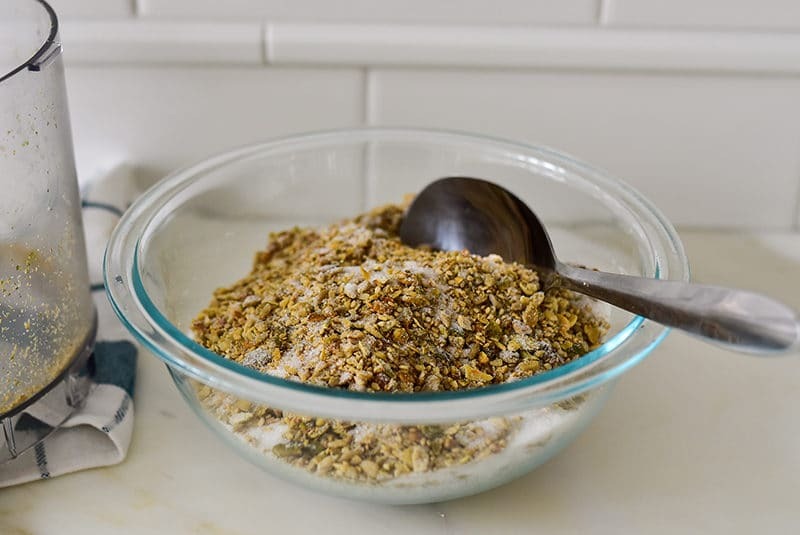 A combination of seeds make a filling that competes handily with traditional nut fillings, so anyone with nut allergies or simply avoiding nuts can enjoy this buttery, crisp, fragrant pastry. All of the tips for making traditional baklawa with nuts can be used with this recipe (except…the nuts!). Read tips and info here. Watch the baklawa videos here and here. I am asked with some frequency for substitutes for ingredients in our recipes. It ranges from the reasonable: can you use zucchini instead of green squash for koosa? Sure. 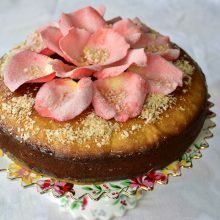 To the more challenging: can you bake that talami bread with gluten-free flour? Um, don’t know. While one of my favorite things in this life is to play with my food, finding substitutions for various dietary restrictions, particularly in baking, has not found its way to the top of my priorities list. Part of it is time and curiosity, but part of it has always been my strongish purist’s feeling that if I can’t have the real thing, I won’t eat it at all. I mean, tomato kibbeh is delicious, but that’s not to say I’d eat tomato kibbeh instead of kibbeh nayeh (raw kibbeh) and feel like they were pretty similar. When a few of my cousins and I were talking all things Lebanese baklawa earlier this year (at Uncle Bruce’s funeral luncheon; food does comfort), and Holly told me she bakes a serious lookalike, nearly tastealike nut-free baklawa, I stopped in my tracks. I’d been asked about a substitute for the nuts in baklawa before, and I was sure my answer had been something along the gentle if unhelpful lines of: best find a different dessert to love. Baklawa is inherently nutty. But here Holly has a [beautiful] child who can’t eat the nuts. It may be that you can’t eat the nuts either, and no doubt you have a beautiful child or friend somewhere in your sphere who can’t eat the nuts. Aunt Maureen has been to the classrooms; she knows the reach of the nut allergy (no peanut butter allowed. I would have starved when I was a kid without it). It strikes me that cooking and baking with love is all about cooking and baking what others will eat and enjoy, and that many people who I love, especially all of you who I share recipes with, have special considerations and restrictions when they eat. Dad was my first exposure to this, along the lines of Tofutti instead of ice cream, and salt substitute (he cringed about the salt sub, but really got into the Tofutti, which he called Tuck-fouti. Maybe he was Arabic-izing it, but probably just playing with words in ways only he could do). So Holly gave me the run-down on her nut-free baklawa (pepitas, sesame, sunflower seeds), and said that it was really good. In a totally separate conversation, I got the same run-down from her husband (I figured it couldn’t hurt to get third-party confirmation of the seed substitute…). He was over the top, eyes popping and beyond excited about what his wife had done and said she’s way too modest about how fantastic it really was. They all ate it and loved it just as much as traditional nutty baklawa, he said. I was excited to hear about it. In my purist’s soul, though, I was skeptical. Baklawa=nuts, right? The seeded, nut-free baklawa took me months to approach. I did it the way I approach all of my testing: quietly (no music while I work, ever), alone in my kitchen where failures of every sort are free to be. For the layers, I was concerned that the filling would fall apart, since seeds don’t have that same nutty-fat that seems to help it hold together. Then I remembered that more than one commenter on my baklawa posts let me know that authentic in-country Lebanese baklawa diamonds have more than one filling layer. As in: several sheets phyllo, then thin layer of nuts, then several sheets of phyllo, then thin layer of nuts, finishing with more phyllo. Butter all around, it goes without saying. The results of all of this were something worthy of eye-popping!! 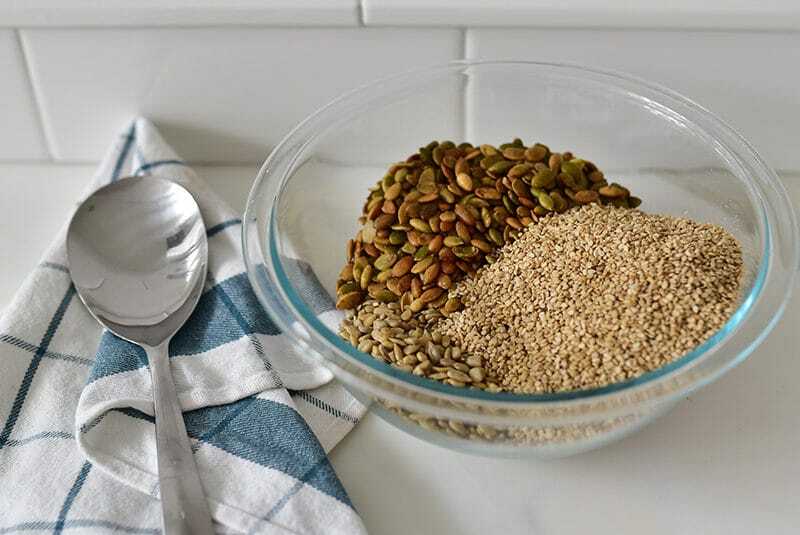 What I loved about the seeds rather than some of the other nut-free solutions I’ve seen is that they do in fact resemble a nut texture and flavor. I don’t want dried fruit in my baklawa, or spices (see Great British Baking Show season 2015, episode 9. Just no). I want nuts and I want orange blossom syrup. And if I, or more importantly, you or the people any of us love can’t have nuts, then let’s find us a solution that’s close to what we love. Once I had the components the way I wanted them, I served my nut-free baklawa without saying much about what I’d done. And I tell you: nobody noticed that these weren’t nuts!!!! Me, I noticed (I sound like Aunt Hilda…). But Peggy said she couldn’t taste much difference, and thought it was super delicious. Dan said he liked it as much as the nuts or even better!! I do chalk that up at least partially to the fact that the batch he tried was under-baked, which in his world is perfectly baked. There has been some excitement over on Facebook with my Lebanese Baklawa video (haven’t seen it? Or don’t follow along there yet? Love for you to join me here and here!) with Aunt Rita’s #gamechanger method of pouring the butter over all rather than buttering each layer. Many of you have asked about a nut-free option (I was so happy to be able to say I’m on it! Stay tuned! 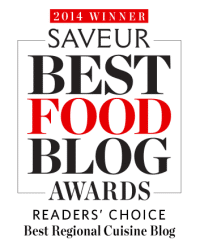 ), and many also about a BUTTER-free option, and a GLUTEN-FREE option. What?! I might have said in the past that it simply shouldn’t be done. There are lots of other desserts to love. But now with the nut-free baklawa success, I’m feeling like baklawa miracle-working is absolutely possible (how appropriate in Advent!). So I’ll be headed back into the test kitchen for more baklawa options for everyone to love. A special filling of seeds and sugar, along with layering the filling twice, make this a wonderful Lebanese baklawa. Perfect for those with nut allergies or anyone avoiding nuts, but also just delicious to try for fun! Do everything as you would for my walnut baklawa diamonds, except for the extra layering (and the nuts...). 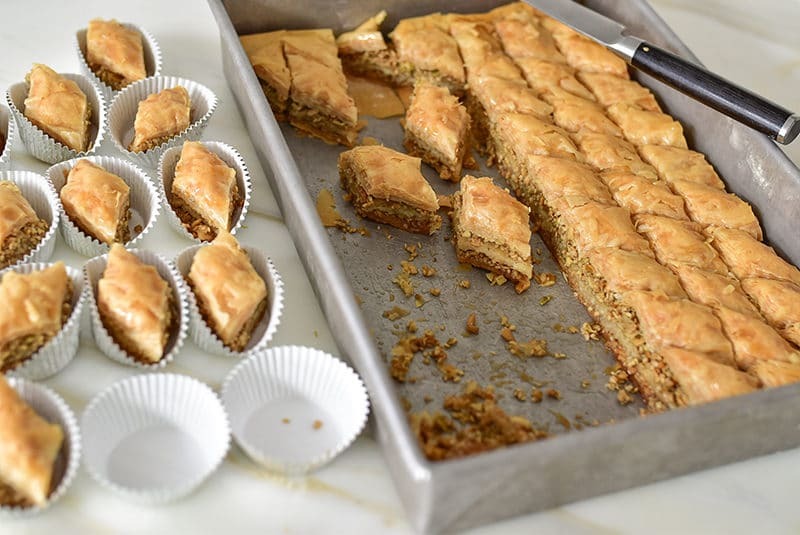 Read through the entire recipe before you start, and get more tips for making excellent baklawa here. To make the syrup (do this in advance as it has to be cold! 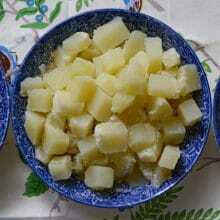 ), in a small saucepan, combine sugar, water and lemon juice and bring to a boil over medium high heat. Reduce heat to low and simmer for 5 minutes. 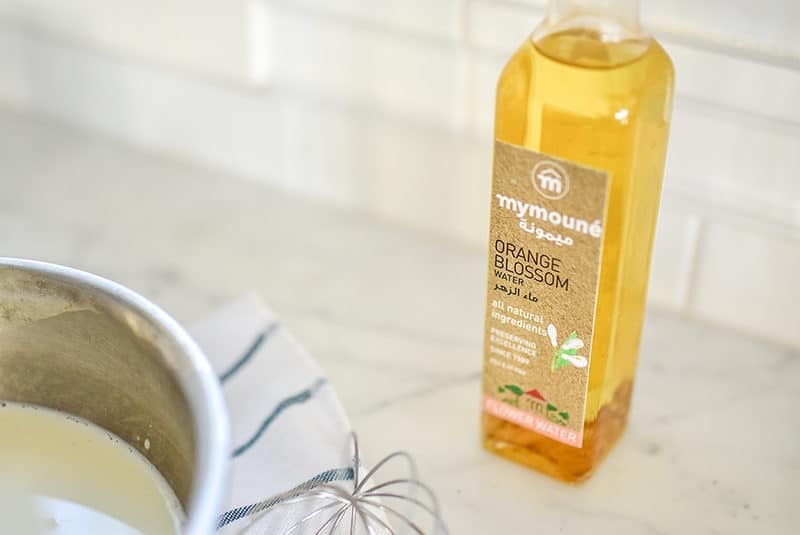 Add the orange blossom water. Pour into another, heatproof, container, then cool and chill completely. It is essential to pour cool/room temperature syrup over the hot pastry when it comes out of the oven. To make the sugared seeds: Process all of the seeds in the food processor using pulses, taking care not to go too far (to avoid making too much seed-dust). Combine the seeds and sugar stirring until all of the seeds are coated. Assemble the baklawa: Preheat the oven to 350 F. Open one sleeve of the phyllo and unroll it on top of the plastic it is packaged in. Keep the phyllo covered with a towel. 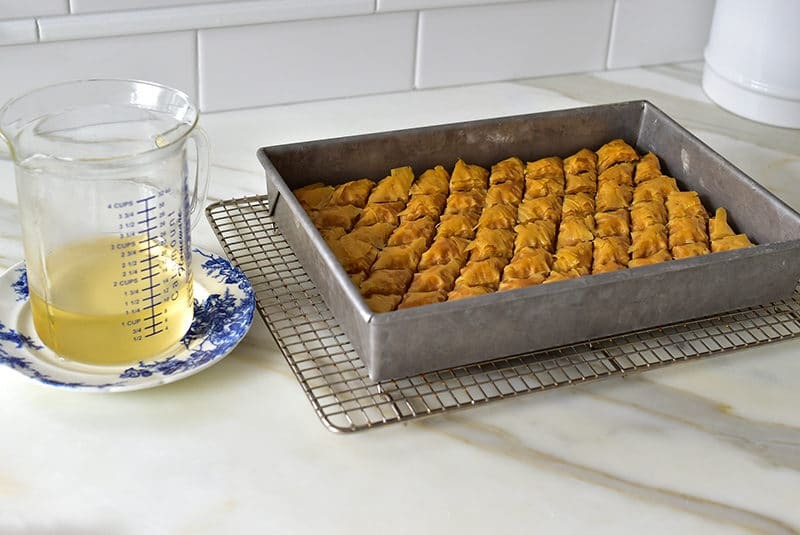 Use a metal, straight-sided 13 x 9 x 2-inch pan and trim the phyllo to fit. Lay the pan over the phyllo, and cut about an inch off of the short side of the phyllo so it will fit in the pan. It’s better to leave the phyllo just a hair larger than the pan because it will shrink when it bakes. 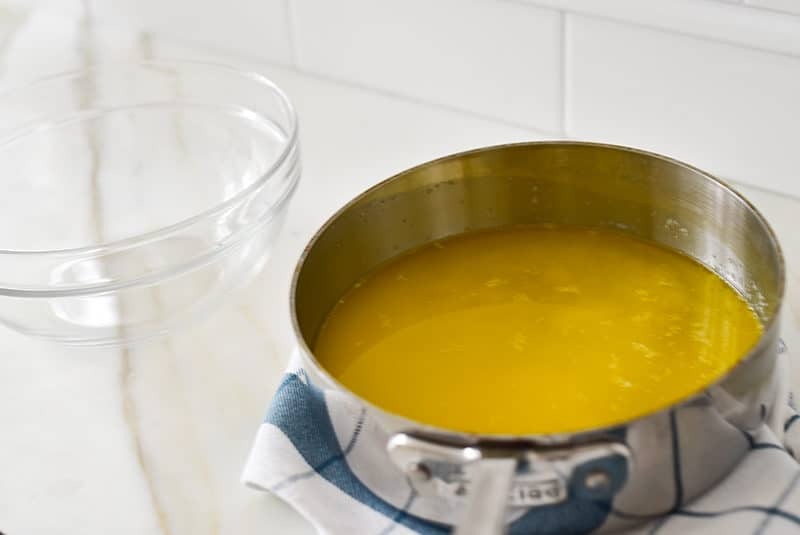 Brush the bottom of the pan with clarified butter. Lay 2/3 (13 sheets) of the stack of phyllo leaves in the pan. Spread half of the seeds over the phyllo in one even layer and place the remaining 1/3 (7 sheets) of the phyllo over the seeds. Open the second sleeve of phyllo and trim the same way as the first sleeve. Lay 1/3 (7 sheets) of the second stack of leaves over the phyllo that is already in the pan. 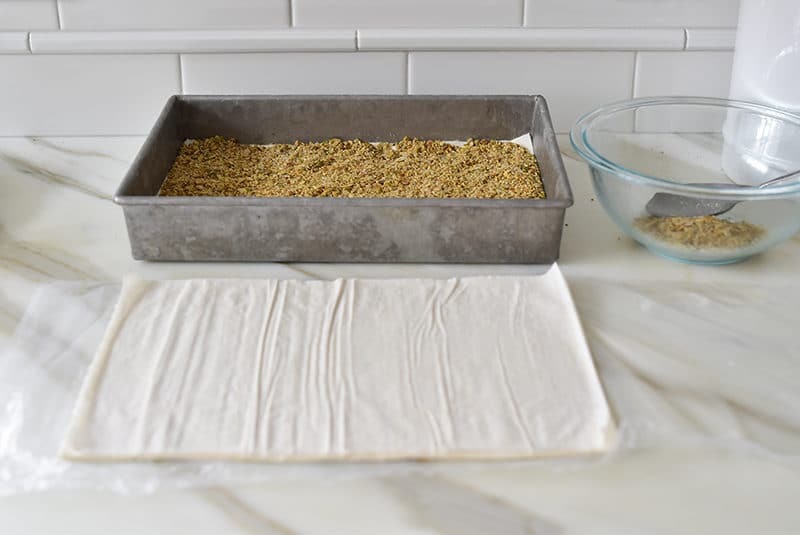 Spread the remaining half of the seeds evenly over the phyllo, then place the remaining phyllo stack (13 sheets) over the seeds, taking care that the top layer is a sheet that is not torn. Take a layer from the center of the leaves for the top layer if necessary. Brush the top layer or two with clarified butter. 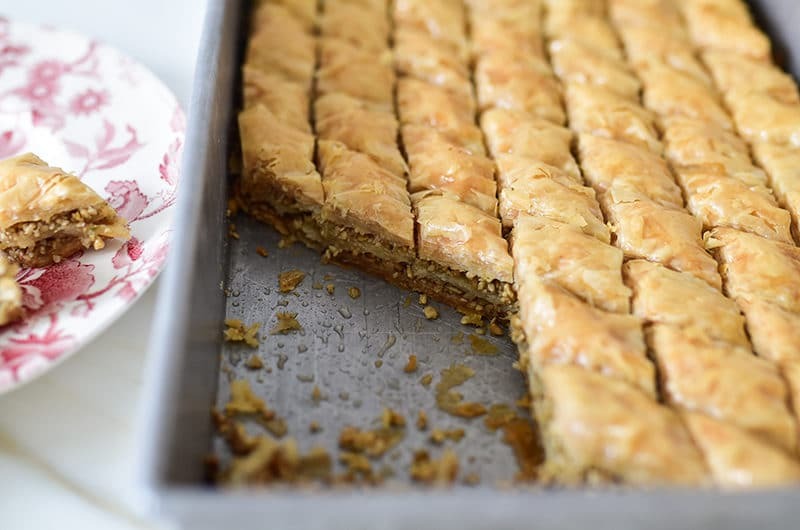 Using the tip of a very sharp chef’s knife, cut the baklawa into diamonds by cutting six rows (5 cuts) lengthwise and ten rows (9 cuts) crosswise on the diagonal. Make slightly smaller pieces by cutting 7 rows (6 cuts) lengthwise. Lightly score the top with your knife before diving in so you can see where the cuts will be. 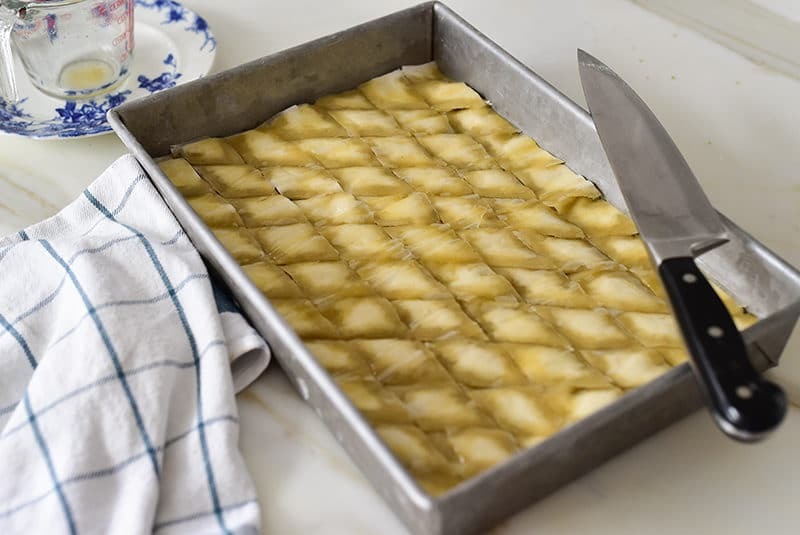 Use your dominant hand to cut and the other hand to hold the top layers of phyllo down while cutting, and be sure to cut all the way through to the bottom of the pan. This is essential so that the butter will seep through all layers. The knife is held almost perpendicular to the pastry, cutting straight down into the phyllo and nuts all the way through. The top layer will lift and in general make you want to curse as you cut, but just lay the phyllo back down where it belongs and move on. The sharper your knife, the easier the cutting will be. Pour the melted clarified butter over the baklawa evenly. Allow the butter to settle in, about 5 minutes. Bake on the oven shelf second from the top until deep golden brown, 50-60 minutes, rotating the baklawa halfway through baking. Remove the pan from the oven and immediately pour the chilled orange blossom syrup evenly over the baklawa. When the pastry is just cool enough to handle, cut away a few pieces of the uneven edge morsels to eat warm (the baker's reward...). Let the baklawa cool for several hours. Cut the pieces of baklawa from the pan with a sharp knife as needed. Serve in foil mini-muffin cups or directly on a plate, arranged in a circle with the points of the pieces facing the center. Keep the baklawa lightly, not tightly, covered in the pan with plastic wrap or a piece of wax paper for up to 2 weeks. 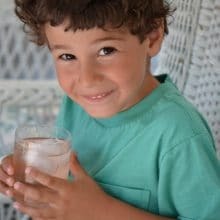 6 Responses to "Nut-Free Baklawa"
I am allergic to tree nuts. And now you are my goddess! Thank you! Where did you get your baklawa pan? Hi Joyce–I like the TraditionalTouch straight-sided 13x9x2 rectangular pan from Williams-Sonoma. Calphalon also makes a good straight-sided pan.